February 14, 2008 - Make sure you like EcoJoes on Facebook to stay updated on green ways to save money and help the environment. Just click the "like" button below. Muchas gracias! Update: This is on the front page of Hugg, so por favor vote for it! Have you ever ridden a bike? Have you experienced the unmitigated exuberance that rushes through your body as you accelerate to the max whilst riding a bike down a hill? ‘Cause I know I have. Bikes truly are t-riffic (especially this energy generating green bike). But now, thanks to Calfee Design, they are even greater. This guy makes bamboo bikes, which look awesome AND are strong as heck. Plus, since they’re made from bamboo instead of carbon fiber, they have a lower carbon footprint than normal bikes. I hear you ask, “Hold up. Will the bamboo break?”. I am proud to answer, “NO”. Instead of using fragile fresh bamboo, Calfee uses special heat-treated bamboo, which makes for a stronger bike frame and dampens vibrations. But to get one of these green bikes made from bamboo, you gots to pay a lot of green. 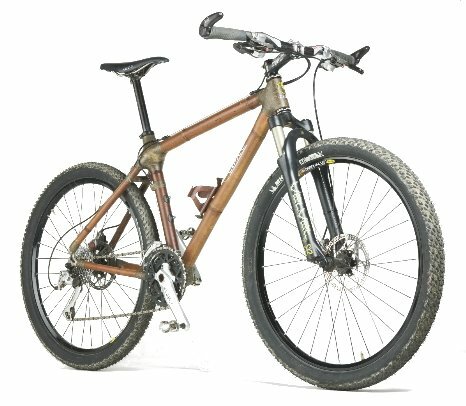 The cheapest bamboo bike frame Calfee sells is about $1,700, so start saving your money if you’re planning on getting one of these mamma jammas. Posted in bike, eco footprint, green business	on Thursday, February 14th, 2008 at 4:16 PM. This is the first time I hear that a bike can be made from bamboo. I am amazed by this idea and I wish if I could ride it. Thanks for this wonderful post and I will search internet for more details regarding this. I hope that I can own one bamboo bike.